I was a last-minute registrant for the Jane Austen Summer Camp, and registered for only the second half of the weekend, taking a miss on the workshops on Saturday morning because I had either attended similar workshops before or had skills that did not require workshops such as were offered. 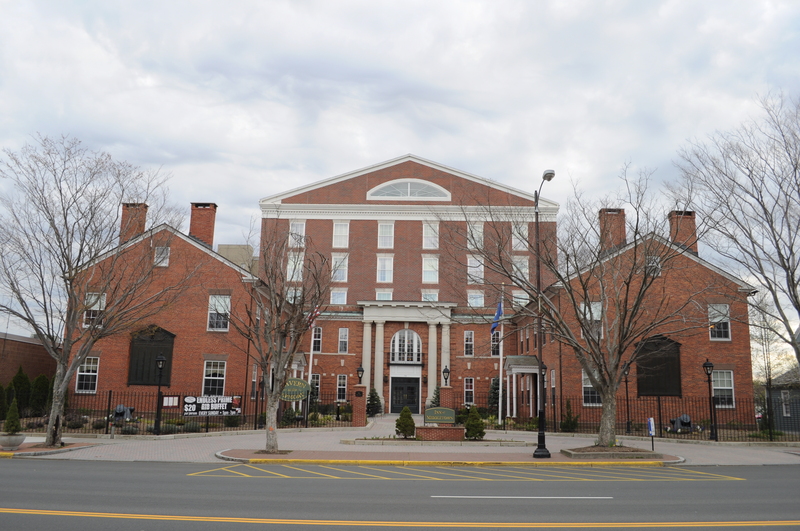 I drove down from VT to Middletown, CT on Saturday afternoon wondering what to expect in terms of the area in which the event took place, since such things do tend to color my experience. As I turned onto Main Street, I spied a row of 18th century clapboard houses across the street, and I thrilled to the sight. When I pulled up to the gate of the Inn at Middletown, I was immediately favorably impressed. The Inn at Middletown has the look of an early 19th century manor house, with wings, snubby portico, and miniature curved drive. When I walked inside, the Inn continued to enchant me with its central curved staircase, immense chandelier, fireplace, and patterned marble floor. The room I shared with my friend Shari was tasteful, but I barely had time to enjoy it before I had to begin my transformation into a Regency lady. Our Saturday evening began with gathering in the second floor lobby, where alcoholic beverages were dispensed to those willing with shillings. Some faces were familiar; we have crossed paths at other JASNA, time-travel, and dance events. 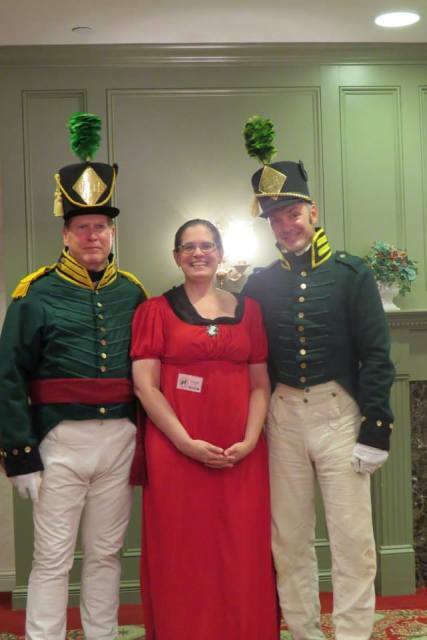 Most of us, I am gratified to report, were dressed in period outfits, and we exchanged compliments and admiring looks. When we entered the conference room for dinner, I was pleasantly surprised to see it looking period-appropriate, too, with nicely painted woodwork, wallpaper, double-hung windows dressed up in patterned draperies, wall sconces, a boarded-up fireplace (well, it *is* summer) with a mantel and mirror above, and a sideboard in a recess with a mirror overhanging it. Of course, I made my way to the center table so that I could have a great seat for the lecture after dinner by Irene Urban, who is known to me through Regency dance. She is a maven of Regency cookery, but more of her soon. The table was dressed up with a sweet urn of colorful flowers, and everyone had gifts of a sandalwood fan and chocolates in front of her place setting. Lovely chocolates, by the way: They looked like cameos, with a milk chocolate base and a silhouette Jane Austen silhouetted in white chocolate. We started off dinner with a delicious cold soup of Lord-knows-what, but the ingredient I do remember is champagne. More alcohol — terrific for loosening the joints and inhibitions for dancing! Everyone enjoyed their main course, too. I had already heard praise of the Inn at Middletown’s cuisine, but tasting was believing. The presentation was also quite lovely. Well done! We did not enjoy a last course of dessert because that was saved for the break during the ball. However, Irene Urban’s lecture on Regency dining was a delicious treat for the mind, and I would have willingly gone back for seconds and thirds, but it was all too quickly over, with no Q and A session. Irene dropped tantalizing tidbits such as what was stocked in a Regency larder, including all the dead animals, which she accompanied with an etching of the same. I would imagine that if cruel Regency parents had wanted to punish their naughty little ones, they could have locked them in a dark pantry for an hour. Irene is not an all-talk-and-no-action lady; if you have ever attended an event with which she is connected, you are treated to period delights created from recipes that she has adapted from vague original recipes in her collection of period cookbooks. 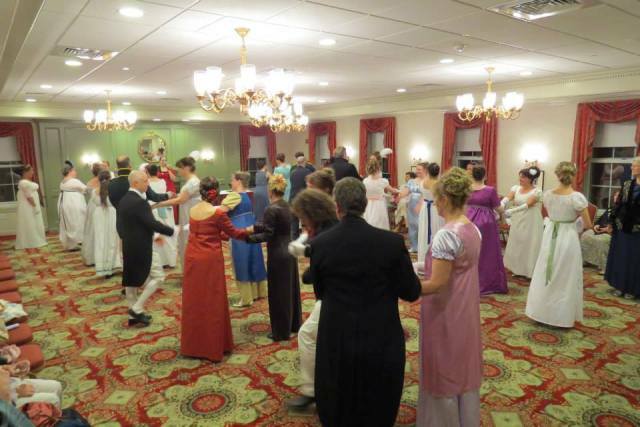 Next up was the ball, which was called by Susan de Guardiola, a Regency dance expert. The dances were simple to suit those who had never danced period dances before. The room was splendidly lit up, quite full of company, but not insufferably hot, so we were spared the trials of E. and M. The crowd organized into two longways sets, and off we went, balancing, dos-a-dosing, slipping, turning, gazing, flirting, and attending. I think we all acquitted ourselves rather well, and as a reward were treated to sumptuous desserts during the break, as well as the raffling off of two splendid gift baskets and several smaller gifts. Sunday’s activities began with a promenade to a local historical house museum [the General Mansfield House]. Many folks chose to dress up again, and I believe we looked fresh and charming in our day gowns, bonnets, reticules, and parasols. We gathered in the lobby, then strolled out through the front courtyard, crossed the street, and there we were. The docent of the museum greeted us on the steps, then spent the next twenty minutes lecturing about the history of the house and its occupants while we stood, wilting. An older woman required a chair, which my friend Shari borrowed and brought to her, and still the lecture continued! We were finally allowed to tour the house and the grounds, which were not extensive but had a few suitable places for photo ops. 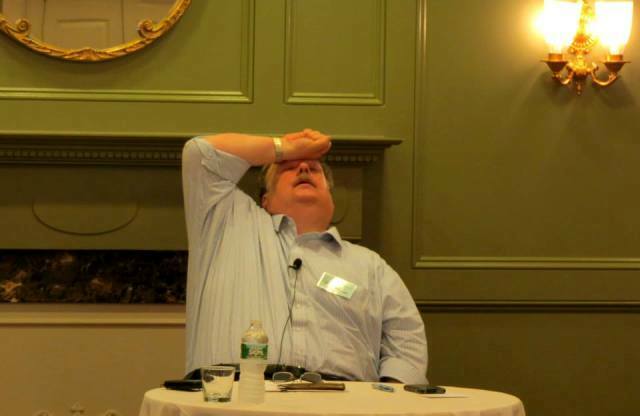 Dr. Schenker – “Is that _really_ all you can remember?! thoroughly enjoyed the lecture (and it made me wish that I had come for the full weekend so that I could have heard his other lecture Friday night), the only thing he said that I can quote was that he referred to Jane and Charles Bingley as the couple downstairs, the Mertzes of Jane Austen’s couples! What a thing to remember. 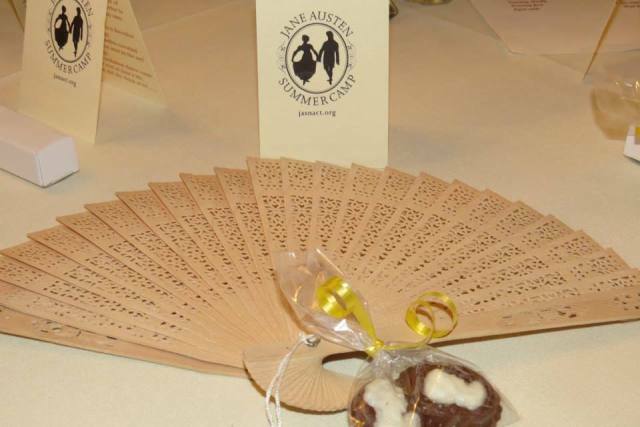 The weekend was capped with an ice cream social, the raffling off of two more marvelous gift baskets and smaller gifts, and the screening of the soon-to-be released film Austenland. I do believe that this movie is haunting me. I had already sat through the initial free preview for JASNA-NY members at the Sony screening room in New York and felt I had wasted two hours of my life. I had even squeezed it into my tight schedule when it was offered because, of course, it was a one-time-only experience. However, two or three more free previews were offered after that to JASNA-NY members. 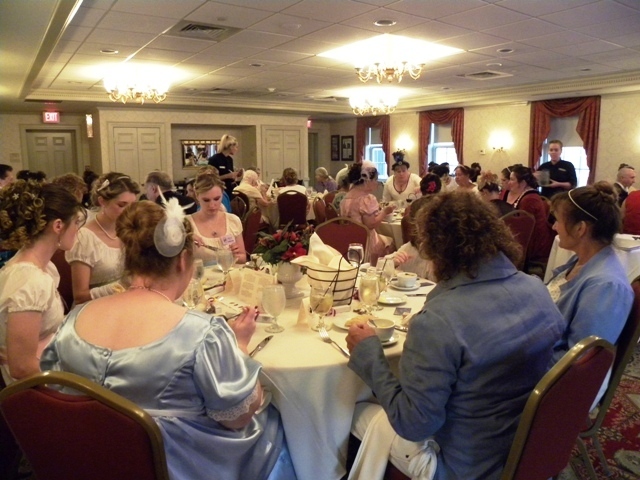 This past weekend, all the way up in mid-Connecticut I thought I could enjoy a good Austen movie with other Janeites, when, lo and behold, Austenland again popped up and put a pin in my Austen euphoria. N.B. I just received an e-mail from JASNA-NY about yet one more free preview of Austenland, to take place on Tuesday, July 30, in Manhattan! I left very glad that I had made the effort to drive for four and one-quarter hours the 260 miles from my home to the Inn at Middletown. Everyone with whom I spoke was positive about all aspects of the gathering, from the venue to the food, from the workshops to the lectures, from the ball to the gift baskets and the camp store, all were praised. It is testament to the tremendous concerted efforts of all the organizers of this event, and I hope to see it repeated and expanded in two years.